We begin this two-part series with a basic overview of the different types of service, emotional support and therapy animals. So, you’re thinking about getting, or someone has recommended that you get, a service dog, therapy animal, or emotional support animal (ESA). Or perhaps you have reached the decision that you need a service animal to help with your disability. Whether you self-train your animal, work with a professional trainer, or obtain an animal that has already been trained, ask a million questions to make sure that you have all the information you need. Getting an animal is at least a 10-year commitment for you and a lifetime commitment for your animal. There are differences among the three main types of “working” animals. The following information will help you distinguish among these three types. A service dog (can also be a miniature horse with some stipulations) is any dog that has been individually trained to do work or perform tasks for the benefit of an individual with a disability that they cannot do for themselves because of their disability. There are many types of service dogs and many different types of tasks that they might be asked to perform. A service dog does not have to be tested, registered, or insured and has access to most places where the general public is allowed. 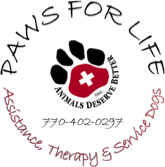 A therapy dog (or other therapy animal) is tested, registered, and insured to go with its owner to visit facilities, such as hospitals, nursing homes, and schools, and to participate in reading-to-children programs. These animals are only permitted where they have been invited, and permission has to be obtained from the organization the animals are visiting. In addition, documentation of training of the animal by a reputable organization must be provided to the organization. An ESA is a dog or other common domestic animal that provides therapeutic support to a disabled or elderly owner through companionship, nonjudgmental positive affection, and a focus in life. If a doctor determines that a person with a disabling mental illness would benefit from the companionship of an ESA, the doctor writes a letter supporting the person’s request to keep the ESA in “No Pet” housing or to travel with the ESA in the cabin of an aircraft. ESAs are not task-trained service animals. ESAs do not have to be tested, registered, or insured, but people who have an ESA require a letter from a doctor stating their need. Only a judge can truly determine whether a person is legally disabled. Should the case arise in which a person with a service animal is brought to task, that person must be able to show that they are indeed disabled and that their service animal performs tasks to help with their disability—tasks that the person cannot do. To begin, you should discuss getting a service dog or with your medical caregivers and think about your living arrangements and whether you have the financial resources to have a service dog. To find a service dog program or trainer, you can begin your search on the Internet, but remember, just because the program or trainer appears on a list on the Internet, it does not mean that the program or trainer is qualified. You still need to do more research. Kimberly Brenowitz is a volunteer with Animals Deserve Better, Inc., and Paws for Life in Marietta GA. She can be reached at adb@animalsdeservebetter.com. See Also Part 2: A Service Dog Can Do That?